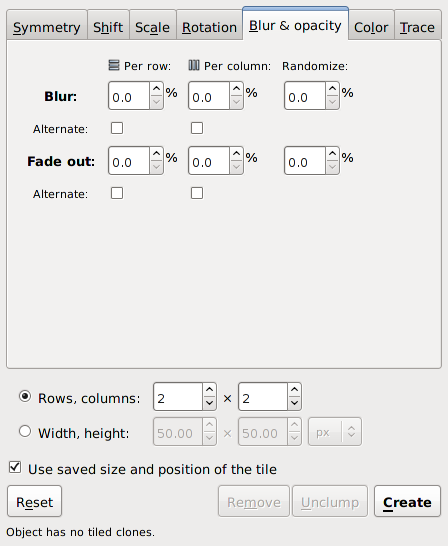 The Blur and opacity tab allows one to change the blur and/or transparency of each tile depending on the row and column position. The Blur and opacity tab of the Tile Clones dialog. A Gaussian Blur filter can be applied to each clone with different blurring values. The blur change is specified in percent. The change in blur can be specified to Alternate between a positive and negative value; however, a negative blur value can be entered in the Per row and Per column boxes. A Randomizer factor can also be specified. 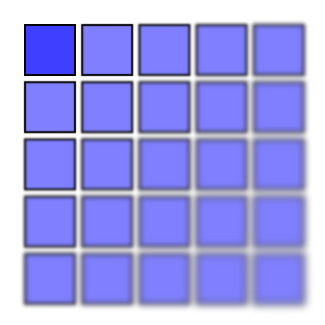 A P1 symmetry tiling with a 2% increase in blur for each row and column. The opacity change is specified in percent. The change in opacity can be specified to Alternate between a positive and negative value. A Randomizer factor can also be specified. A P1 symmetry tiling with a 10% decrease in opacity for each row and column. 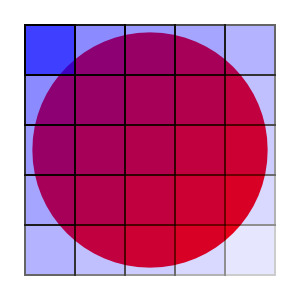 A red circle has been placed under the tiling to illustrate the changes in opacity.